Monster Monpiece is a card-based strategy game that became infamous for its rubbing mechanic. As a fan of trading/collectible card games, I decided to check it out and see if the game deserves its wrap or not. After the story kicks off, you must travel around through the various regions of the world to procure their Magna Quartzes and keep them safe. The map consists of various points connected by lines laid over a picture of the region's topography. There are occasional gates that block your progress and you must fight in order to proceed. Their are small offshoots where there might be new opponents, extra money, rub points or cards. At the end of each area, you'll fight the boss, then see some more story and move onto the next area. The card battles take place on a 7x3 grid separated into 9 blue squares, then 3 gray squares and lastly, 9 red squares. Castles flank both of the short sides and represents you and the opponent. On your turn, you can place one of your cards on any of the unoccupied blue squares. They will attack any opposing cards in front of them, and move one space forward in any turn possible. Each card has a mana cost to summon, and you recover 3 mana at the start of each turn. If you have played any trading/collectible card games, you should be right at home with how battles flow. It does seem really simple, but of course it's much deeper once you start playing the game. There are melee units that are strong, but can only hit in front of them, ranged units that can hit a space a few in front of them, healers that can restore a card's HP, and magic units that can power up a card's attack. You can even fuse cards of the same type, and summoning the same color card a few turns in a row will provide very useful bonuses. At first you might not need to pay much attention to these, but they will become crucial towards the middle of the game. There are various skills and "potentials" that cards can have. Potentials activate when the unit is summoned. Skills either activate when summoned (but take mana), an unit attacks a base or when the unit is defeated. The two most common potentials are "hyper", which lets a unit move on the turn it is summoned, and "stationary", which, well, keeps the unit in place. Skills are much more varied. They can reduce an enemy's attack, HP, increase the opponent's mana reserve or other effects. My biggest annoyance with the skills is just how many the computer opponent has. It seems like every unit they have will at least give them mana when they die. Even if I had the same card and it appeared to be the same level, mine didn't have those skills. And if their cards were a lot higher a level, why would you be encountering them so early in the game? I rarely lost because of it, but it's still frustrating to feel like the deck is stacked so much against you. The base cards you get out of the packs will not usually have skills or potentials on them. For that, you'll have to power up the card using a procedure that made this game so infamous: First Crush Rub. You will have to spend Rub Points and then do a minigame to power up each card. The minigame requires you to tap, rub or pinch the picture on each card while holding the Vita sideways. If you do it well enough, you'll enter Extreme Love mode, where you rub the front and back touch pads rapidly to increase the tension meter. It looks strange, but sounds innocent enough. However, combine that with the fact that every card is a girl, and well... you can see why it became so infamous. Plus, when the cards level up, the picture changes and the girl will be less clothed then they were before. Not completely naked, mind you, but if you've watched any anime then you can probably guess how skimpily they are dressed. Personally I didn't find it so bad, but it's not a function I would do around random people. There was a funny instance while I was doing it though. When I entered Extreme Love mode, I changed my grip slightly so I wouldn't drop the Vita while furiously rubbing it. I accidentally put my finger on the volume up button, so as I'm rubbing and the monster girl is moaning, she keeps getting louder. I see the volume going up, and try to simultaneously move my finger off the button, keep rubbing, not drop the Vita, and laugh. It was pretty funny, and would have looked hilarious to anyone watching. Anyway, the only real gripe I have with powering them up is that you won't know how a card changes until you do it. Most times they get stronger, but sometimes it's debatable if it was an increase or decrease in usefulness. Sometimes they would get stronger, but cost more mana. Sometimes their attack would increase, but they would get the "stationary" skill, meaning they're better for defense than offense. While each type of card will always level up the same way, it would be nice to be able to see what was going to change so you can effectively decide if it will be worth it. It seems you will at least need to level up one card completely so you can see what happens at each level, and cherry-pick the best level of each card for your deck. There are 8 areas to conquer, plus an extra one that opens up after the completion of the story. Each area takes 1-3 hours, depending on what extra fights you do, and your wins/losses. If you want to do any of the extra fights or routes, make sure to do them before entering the main city of the region, since you won't be able to go back. After the story is completed, an extra area opens up with the hardest battles the game has to offer. You'll get a decent amount of playtime with the game, and even more if you can't resist collecting the cards (which I rarely can resist). You can even play other people online if you want to test your deck against the world or just play with your friends. If you can get past the somewhat controversial aspects of the game, it's very enjoyable. It might seem simple, but battles are surprisingly deep and fast-paced. It also makes good use of the touch screen. If you enjoy strategy games or trading/collectible card games, definitely check out Monster Monpiece. Mind Zero follows the story of a high school student named Kei as he tries to figure out what Minds are and why they are able to cross over into our world. To do so, he will meet other "Minders" (those that have met Minds and not been possessed by them) and go dungeon diving. The dungeons and maps are very much like the old Wizardry games. Navigation is in first-person perspective and the grid-like map is filled in as you explore it. There are a few locked doors that sometimes require a switch, and other times use the touch screen to open them. My biggest problem with the dungeons is how non-sequential they can be. Sometimes, they flow from floor 1 to 2 to 3, but most times they start diverting. The stairs for floor 8 might be on floor 3, and floor 4 might go to 6. It gets pretty confusing, and is really strange. Thankfully, there are teleporters in the dungeons that can ease some of the travel to the various depths. While a lot of the game is reminiscent of the Wizardry series, you don't make your own characters. Instead, you get actual story, dialogue and plot. As much as I do like making my own characters, I liked the characters they made. It was refreshing to play a dungeon crawler that had characters with personality and dialogue that was sometimes funny. To appeal to both sets of fans, you can choose English or Japanese spoken lines every time you load a save file. The game is separated into "Phases", basically story chapters, which start with some plot, then open up a dungeon for you to conquer before moving on to the next phase. There's also requests (side quests) to do if you want extra money or insight into the characters. Battles are where the game really stands out from its competition. First, battles appear to be first-person, like the dungeons, but that's only for the enemies' attacks. When your character attacks, you see them or their Mind perform it. To me, it's a nice evolution of the fights in first-person RPGs. Second are the Minds, which are partner creatures from the other realm. While you Mind is active, you deal more damage (to most enemies), can use skills, and any damage you take is deducted from you MP, not HP. You also lose some MP every turn your Mind is out. If you run out of MP this way, your Mind will go away until re-summoned. If you lose the remained of your MP when being attacked, you will suffer a "Mind Break" and will be stunned for a turn, leaving you very vulnerable. I quickly learned that having your Mind up as much as possible is key to battling effectively. MP is an easier resource to control in this game, it just took adjusting my mind to think of it that way. Since skills can only be used when the Mind is active, and take HP and or TP, it seems more logical to treat HP and MP and MP as HP. The characters die pretty quickly when taking HP damage, and since they deal more when the Mind is active, there's little reason to put them away. There are a few enemies that take less damage from the Mind, and you don't want to run out of MP or worse, get Mind broken, so you don't want to throw them on every turn of every fight. There's some strategy involved in using them, and I think the combat is good in the game. Equipping skills is not as intuitive as it should be. Abilities, like heal skills, are cast from the same menu as equipping them. So one button will use it, and another button will bring up the list to equip them to a slot. Still another will let you swap them with ones already on the list. While that function is useful, remembering which button does what is an issue. Also, partway through the game you gain the ability to use extra skill cards to power up skills. It's a good thing that the limit of cards you can hold is so high, since I had close to the max before I gained this ability. It will say on the card what leveling it up will do, but without hard numbers, I'm not sure how effective it is. My powered up skills seem marginally better than the base ones, but I'd like to see just how much better they are. Besides the healing ones, most skills didn't seem worth using very often. There are over 10 phases in the game, and each takes several hours to complete. I had to do some grinding for most dungeons, which will of course increase the playtime. I can easily see spending 50 or so hours to complete the main game. While progressing through the story, you'll get some trophies, of course. Most of the trophies come with normal play, but there area few you'll have to work toward. Doing all the side quests, getting every skill card and uncovering every square of every floor of every map would be ones most likely to be missed. There is one for beating the game on the hardest setting, so make sure to do that if you want to get them all. Overall, I had fun playing Mind Zero. I didn't expect to like it, since I don't really like the Wizardry games and similar titles, but it didn't have many of the really frustrating aspects of those games (no fighting more than 6 guys, no formation nonsense). I enjoyed the characters and dialogue, and combat was fresh and entertaining. The biggest problems I had were the strange dungeon designs and the long, long load times. While not the best RPG on the Vita, I'd recommend the game for fans of Wizardry-style games and people who like old-school turn based RPGs. Anyway, to reclaim your lost shares (or take ones from other nations), you will have to train your chosen idol, raise their stats, and put on concerts. Most of this is done by picking menu options to raise a stat, get more fans or rest so you don't stress out the CPU. Stat raising activities have four different levels- bad, standard, good and excellent- that grant different amounts of stat and stress gains. I haven't played any other idol simulator games, so I'm not sure how similar it is to those, but I understood the whole process pretty quickly. You make one selection a day, so the game progresses swiftly. The time limit to have the most shares is 180 days, but it's pretty easy to finish the game in much less time. Especially if you max out a CPU's stress, which ends the game immediately. The girls can even form groups, although you will share the shares. Concerts are what you'll use to get the shares back from MOB48. While there are tutorials, it still took me a few tries to get the hang of what to do. The idol will sing and dance on their own, and it's your job to do the stage props and camera angles. Whenever the audience cheers or chants, use whatever effects you have (up to three) to raise the audience meter. Once I figured out to just use all of the ones that weren't on cooldown, my score vastly improved. The camera is a lot trickier to work. There are four different angles, and figuring out when to switch them is a lot of trial and error, mostly because it moves the meter so little that it's hard to tell if you did it right. It seems to get boosts if you change the camera just before a new line of the song begins. 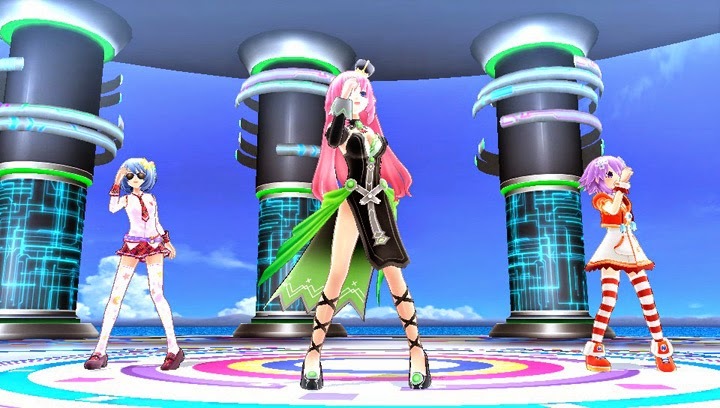 If you are solo with the idol's personal song, you can activate HDD. You can get more points during your transformation, but the limitations make it not as useful, so I didn't use it very often. There's only 5 songs, so it's easy to learn when to best use stage effects, camera angles and HDD forms. It might only take a few hours (around 5 for me the first time through each girl) to get through the game for the good ending, but there are 4 different girls and three endings for each. Plus, there are many different scenes to see depending on stats, friendship and stress. It all adds up to a good 30 or so hours of play, and even more if you are aiming for 100% completion and the trophies. The "true endings" themselves require you to see several key scenes and answer them correctly. Seriously, if you pick even one option wrong you won't get it. Unless you are using a walkthrough, that's a lot more playtime if you're intent on getting all the endings. The new game+ option is really nice, since you will keep your stats, making subsequent trips through the game even faster and easier. The trophy list has a 3-way split with first/last types and endings. Each girl has a trophy for each of their endings (12 total). You'll get some for selecting the menu options the first time, and many for compeltion (all events, costumes, etc.) It's easy to get a chunk of them just by playing through the game, although the true endings and all events will take the longest time. If you are a fan of the series, you will get more out of Hyperdimension Neptunia: Producing Perfection. While the game itself isn't canon, it still does its job of lampooning gaming (especially the awesome credits scenes!) and the characters themselves. It's a fun little diversion of a game that is more relaxing than taxing.